A plastic free mini wooden brush, with wooden pins and rubber cushion. The brush has one pinhole free at the bottom to allow airflow. Designed to message the scalp and stimulate circulation. They are anti-static and perfectly rounded. 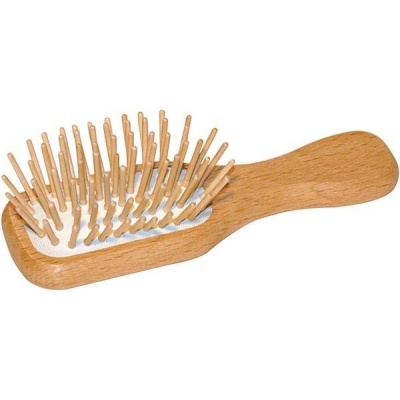 A perfect travel wooden hairbrush. I keep one in my bag, which is handy for windswept days. All materials are of the highest quality. Responsibly made in Germany. Measuring - 119 x 38mm.